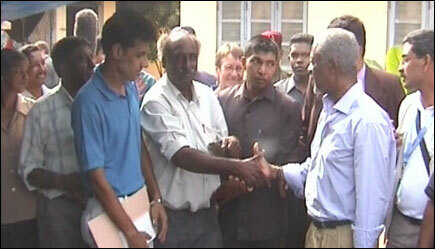 Mr.Kofi Annan, Secretary General of the United Nations Saturday evening paid a thirty-minute visit to Trincomalee. He consoled Tsunami affected Tamil refugees at Alankerni Tamil School and Muslim victims sheltered in Kinniya Central College. UN officials cancelled the inspection of the Tsunami destroyed Kinniya government hospital site at last minute. However Mr.V.Vigneswaran, Convenor of the Trincomalee Tamil People's Forum (TTPF) handed over a memorandum to Mr.Kofi Annan when he met some local civil leaders at the Kinniya Central College after visiting Alankerni. The memorandum urged Mr.Kofi Annan to visit the North. Mr.Kofi Annan arrived in Kinniya Central College grounds by a special helicopter. 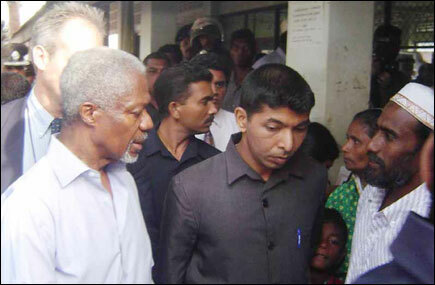 Mr.Gamini Rodrigo, Trincomalee Government Agent received Mr.Kofi Annan when he stepped down from the helicopter. Later Mr.Kofi Annan was introduced to heads of UN agencies in the district, sources said. Immediately Mr.Kofi Annan was taken in a motor convoy to Alankerni, a Tamil village, which is, located about five km from the site he landed. He chatted for a while with Tamil Tsunami victims. He then returned to Kinniya Central College where he met with Muslim refugees who are given shelter. Kinniya division in Trincomalee district topped the death toll more than 559 with few more reported missing due to Tsunami disaster, civil sources said. A group of children affected by Tsunami eagerly waiting for the arrival of Mr.Kofi Annan. The District Medical Officer Dr.Sammem and Dr.E.G.Gnanagunalan and a group of journalists who were waiting for the arrival of Mr.Kofi Annan at the site of the Tsunami destroyed Kinniya hospital were disappointed when they were told that Mr.Kofi Annan visit to that place was cancelled at last minute, sources said. Tamils living in the northern part of Sri Lanka specially Killinochchi, Jaffna, and Mullaitivu are eagerly awaiting to your arrival, so that you could assess Tsunami devastation in order to get relief to the needy and affected, and also you will have an opportunity to see the real ground situation of the war-torn area, which is very badly affected. Tamils in this part of the world have much faith and hope on you, since you are the only person who would assess the situation impartially and neutrally and bring the real situation to the notice of the Donor Nations. This request is made on behalf of the Tamils living in the northern part of Sri Lanka.